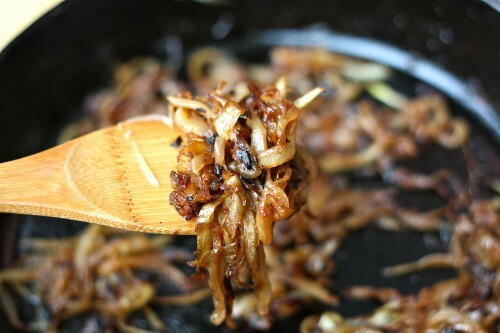 Caramelized onions, my secret weapon for great pizza, are always in season. Peel onion, halve and slice thinly and evenly. Heat a large cast iron skillet over medium high heat and add oil and butter. When butter is bubbling, add onion all at once and stir to coat with butter. Lower heat to medium and cook slowly for about thirty minutes. Stir often, but let onions brown on the pan before turning. Sprinkle with salt, and continue cooking slowly until dark brown, sweet and fragrant.